In Les Deux Alpes, discover this upscale chalet (ref. Princess Blue) with neat decoration, including sauna, steam room and jacuzzi. 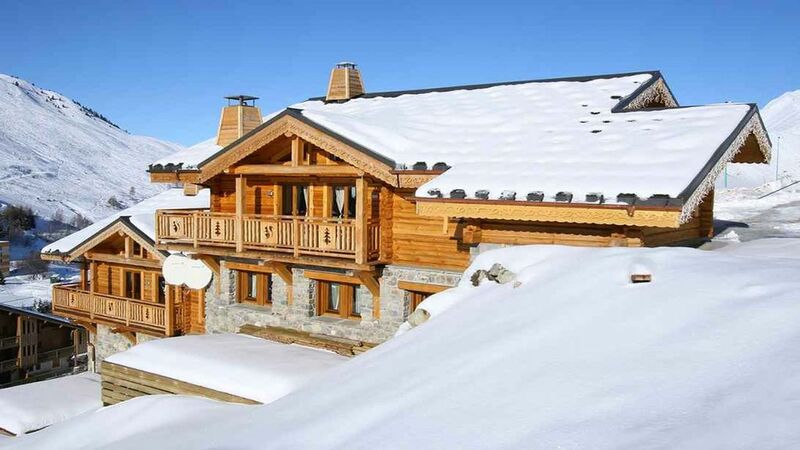 Besides its comfort it is situated 100m from the slopes and offers breathtaking views ... Traditional wooden interior, this chalet has a comfortable living room with a wood stove around which you will relax after your sporty days on the slopes. Discover this chalet with upscale composed of a sauna, steam room and Jacuzzi and offering incredible views of the surrounding mountains. It is located in Les Deux Alpes. This ski resort located in the heart of the Oisans Ecrins Mountains, has one of the largest skiable glaciers in Europe, and is famous in France for its summer skiing and its various activities such as mountain biking since the two Home Alps each year on Free / World Tower Raid since 2004. A few hundred meters from the slopes, take time to relax thanks to its multiple facilities or wellness by the fire contemplating the mountains on the horizon. This warm chalet, with interiors carefully arranged in traditional old wood will meet your expectations. Specialist in luxury vacation rentals, our agency AEC Collection accumulated for more than 10 years an experience with alpine tourism professionals, allows us to make you discover the most beautiful collection of luxury accommodations. AEC Collection makes you benefit of the most beautiful alpine sites. During winter, you will reach the largest ski fields such as 3 Valleys, Espace Killy or Paradiski In summer, on the French Riviera and in Corsica, you will enjoyed the amazing views of our villas on the Mediterranean sea. In Annecy, you will be charmed by the serenity of a villa located at the lake side, at the heart of mountains and overhanging Annecy . For sure, you will share unforgettable time, punctuated by laughs, complicities and various pleasures, in places as exceptional as the accommodation we have selected for you. Aux Deux Alpes, you are just 100 meters from the runway of the Petite Aiguille, and 600 meters from the center of the resort. Une caution de 1500 € vous sera demandé lors de votre arrivée dans le logement, à régler par espèce, chèque ou par empreinte de Carte Bancaire. Elle vous sera restituée dans les 15 jours suivant votre départ si aucun dommage n'est déclaré à l'issue du séjour.